VOL. 11 • ISSUE 3 • 05 . 16 PUBLICATIONS MAIL AGREEMENT # 40766500 INDUSTRY SPOTLIGHT WILL THIS BE THE YEAR FOR AN UPTICK IN M&A FOR THE RESOURCE SECTOR? 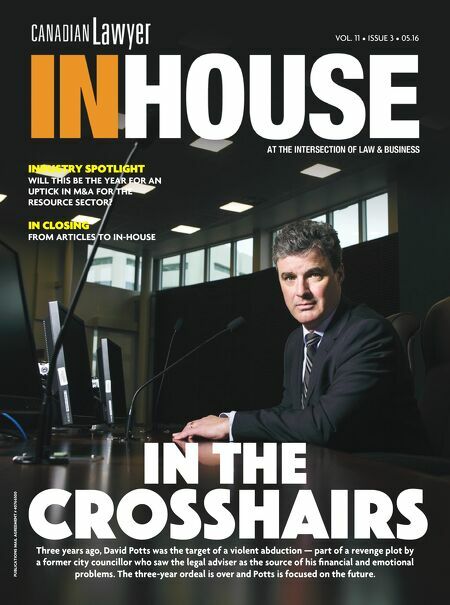 IN CLOSING FROM ARTICLES TO IN-HOUSE in the crosshairs Three years ago, David Potts was the target of a violent abduction — part of a revenge plot by a former city councillor who saw the legal adviser as the source of his fi nancial and emotional problems. The three-year ordeal is over and Potts is focused on the future.